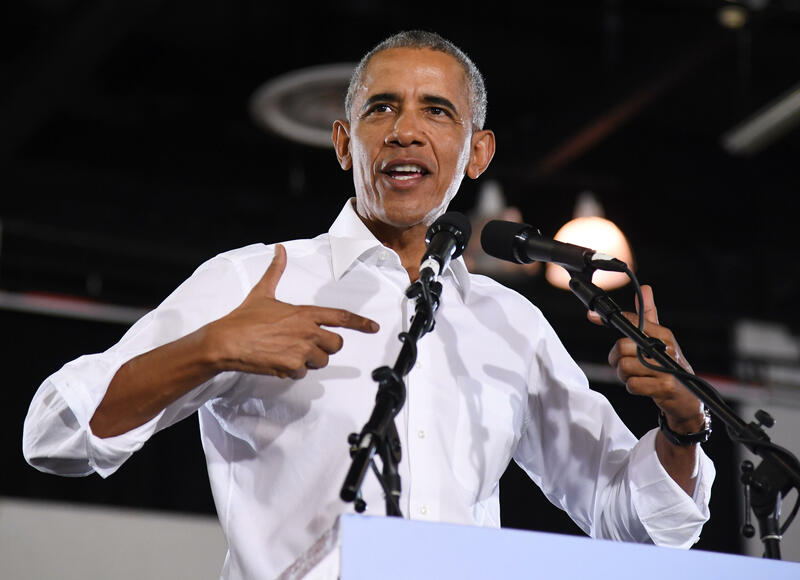 Former President Barack Obama headlined a rally in Las Vegas with Jacky Rosen, the Democratic candidate for Senate, and other Nevada Democrats. He told the roaring crowd to "remember who started" the current trend of economic growth and "the longest streak of job creation on record." "I miss you, too," he told the roaring crowd. Obama called upon Democrats to "restore some sanity to our politics," warning darkly of demagogues who "promise to fight for the little guy" and then "start undermining institutions essential to our democracy." "There are states where Republicans are actively purging voter rolls right now," Obama told the crowd. This kind of politics is not conservative, he said. "It's radical." Republicans, he said, handed out $1.5 trillion in tax cuts "for folks who are already sitting pretty." They "don't even try to pay for it," Obama said. Don't boo, he told the crowd – just vote. "Booing doesn't help anyone. Voting helps." He said the consequences of eligible voters staying home is "profoundly dangerous" to our democracy. "In Nevada, early voting is already underway," he reminded voters. "You don't have to wait two weeks." Obama also took issue with Republicans who have been saying that they will protect patients with pre-existing conditions while threatening to repeal the Affordable Care Act, also known as Obamacare. The former president said, "Let me say something as the man who passed the law that protects people with pre-existing conditions from being discriminated against: They have no way of protecting people with pre-existing conditions in anything they've proposed." "They're just making it up," he added. Obama also spoke about the growing economy and claimed credit for getting it moving it in the right direction. "By the time I left office, wages were rising, uninsurance rates were falling ... and that's what I handed off to the next guy. So when you hear all of his talk about economic miracles right now, remember who started it." The former president is campaigning as Democrats try to build enthusiasm among young people and minority voters and avoid a repeat of the 2014 midterms, when Democratic turnout faltered. Obama won Nevada during his 2008 and 2012 presidential campaigns and Democrat Hillary Clinton carried Nevada in 2016, but Republicans currently hold all statewide offices and are hoping to sweep the state again this year. Rosen is a freshman congresswoman from the Las Vegas area who is challenging incumbent Republican Sen. Dean Heller. The two faced off in a televised debate Friday night. Obama's visit to the battleground state follows visits over the weekend by his former Vice President Joe Biden and a rally by President Donald Trump. Last month, the former president spoke at a rally in California for congressional Democrats. Peter Martinez and The Associated Press contributed to this report.